Subscription requests from institutions (e.g. libraries, companies, organizations, universities) rather than individuals are preferred to make the journal accessible to more readers. Reproduction and dissemination of material in this publication for educational or other non-commercial purposes are authorized without any prior written permission from the copyright holders provided the source is fully acknowledged. 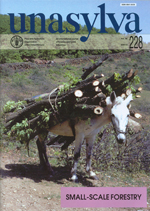 Reproduction of material in this publication for resale or other commercial purposes is prohibited without written permission of the Chief, Electronic Publishing Policy and Support Branch, Communication Division, FAO. Designations employed and presentation of material do not imply the expression of any opinion on the part of FAO concerning the legal or development status of any country, territory, city or area or of its authorities, or concerning the delimitation of its frontiers or boundaries. The FAO publications reviewed in Unasylva may be ordered from any of the FAO sales agents listed on the inside back cover. FAO will process orders from countries where there are no sales agents. Contact the Sales and Marketing Group, Communication Division, FAO, Viale delle Terme di Caracalla, 00153 Rome, Italy.